On September 17th, Blizzard announced that they would be removing the auction houses in Diablo 3. For gamers, this may seem like a very strange move. It is very rare that a company will remove a significant feature of a game, especially when there is no stated replacement plan. But from a sociological perspective, this is a very interesting move that signifies a reaction to the merging of the virtual and real worlds. It seems like the warnings from Jesse Schell in 2010 are manifesting. Last year, Diablo 3 launched with two widespread auction houses, allowing players to trade their virtual items. The gold auction house used in-game currency, while the real money auction house used… real money. Real US dollars. And other worldwide currencies. The Diablo 3 Real Money Auction House. The $250 max buyout is the limit. However, Facebook (among others, though Facebook arguably had the largest effect) changed this with microtransactions that allowed players with more wealth in real life, or more willingness to use the wealth, to translate it to in-game wealth. Schell’s talk has a lot more on how Facebook changed gaming. But despite the influence of Facebook, many gamers stayed on non-FB games. It took Diablo 3 to have a large enough impact on affecting socioeconomics within a game. To some degree, those who were wealthier in real life were wealthier in the game. And to some degree, it was impossible to progress forward unless one was already wealthy. In one sense, Blizzard’s removal of the auction houses signifies a break from the trend of the ever increasingly tangled web of real and imaginary. When we initially designed and implemented the auction houses, the driving goal was to provide a convenient and secure system for trades. But as we’ve mentioned on different occasions, it became increasingly clear that despite the benefits of the AH system and the fact that many players around the world use it, it ultimately undermines Diablo’s core game play: kill monsters to get cool loot. Indeed, the problem was that there was too much trading and the system became too efficient. I actually wrote a lengthy post about this on the Diablo 3 forums last year, called “Why the Auction House is the Main Problem,” which was also mathematically oriented. This article was highly rated and was spread around the interwebs. Basically, the problem was that the increased market efficiency from the auction houses allowed the average player to obtain much better items than they otherwise would, thereby short-circuiting the actual game. Although it seems fairly obvious now as to what happened, the sentiment at the time was that the real money auction house was causing the main problems, but that the gold auction house was fine. Before my thread, I don’t recall anyone making a coherent argument against the efficiency of the gold auction house. Thus it is not all that surprising that Blizzard is removing both auction houses. And even considering Blizzard’s official reason, it is interesting that the economic system in the game has so many analogs in real life. So given the recent news, perhaps we are not quite as firmly on that road as we were last year—a wrench has been thrown in the works. But in the end, the real and virtual worlds are still on a collision course. We should definitely be prepared. Today’s topic as originally chosen by William G (at UT Dallas) was the “Popularity of K-Pop“; however, given that I know almost nothing about K-Pop, and that it would be ironic if I had to do a lot of research to write about the popularity of something, I decided to jump topics slightly. Just slightly. The new topic is also popular in Korea. It is a sport that has filled stadiums and put speed, strategies, and reflexes to the ultimate test. It is the phenomenon known as Starcraft. Got it? Cool, you now understand all you really need to know about why Starcraft is so popular. This has 4 million views so far—not bad for a video less than a month old and related to gaming. Anyways, this is a very early post (it’s 12:25 am right now) because I will be leaving Ithaca very shortly to catch a 1 am bus to NYC. I’ll be spending a lot of time in the JFK airport; I have an idea for a really fun blog post, and I’ll see what I can do with it. See ya next time in Austin! I played World of Warcraft for 20 days. During this time, I spent logged into the game a total of 6 days and 9 hours (plus 1 minute and 7 seconds, if you look closely at the yellow text on the screenshot), which averages to 7.65 hours per day. This is 27.5% higher than my estimate of 6 hours per day that I made on the previous post! Percentage-wise, I spent 31.9% of my real time logged into WoW. In other words, I spent significantly more time on WoW than on sleep. In these 20 days I leveled from 1 to 70, for an average of 3.5 levels per day. I was a human mage, for those of you interested. I completed 538 quests, earned 3097 gold (plus 17 silver and 9 copper), landed 17,352 kills, and dealt 30,163,105 damage. In this time I averaged approximately 5 hours of sleep a night (estimated), pulled two all-nighters (I had never done even one all-nighter before), and took way more naps than I normally do. While I didn’t miss any classes or homework, I did wake up past noon twice (on weekends). But let me emphasize this point: I kept up with school. So Why is WoW So Addicting? Customization is pretty self-explanatory—you have so many options, not just in the beginning, but at any point of the game. Even before you start, you have the objective of selecting two important features of your character: race and class. At the moment there are 10 races, with five on the Alliance (Humans, Dwarfs, Gnomes, Night Elves, Draenei) and five on the Horde (Orcs, Trolls, Tauren, Undead, Blood Elves). There are also 10 classes, and this choice will have a huge impact on your gameplay. Now, not each race and class combination is available, but there are still a great number of options available even before you start the game. Oh, and within each race, you can customize your appearance. Once you’re in the game, you can basically choose whatever you want to do. You can complete quests (they’re entirely optional), kill monsters, train professions, explore, or just chat. 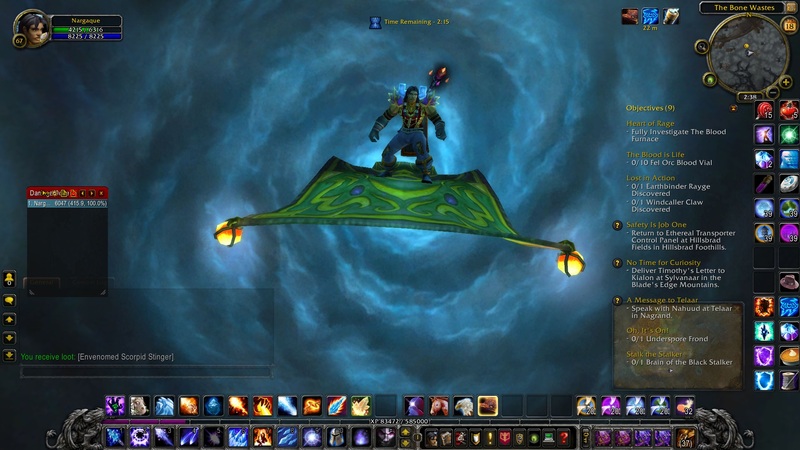 World of Warcraft is the start of super-interactive virtual reality. As you gain levels, you choose different items to use. You’ll decide what stat to focus on. At level 10 you specialize into one of three talent trees (there are three unique trees for each class), giving you even more flexibility. Within each talent tree, you’ll make decisions on which talents to learn. And later on, you’ll be able to switch between two different talent trees. You can choose two primary professions out of a total of 11. They range from Mining to Enchanting, Jewelcrafting to Tailoring, and more. As you discover the world, you decide which quests you do, which monsters to kill, which areas to explore. You decide what you set as your home. You can visit different capital cities. You can choose to clear dungeons, or fight other players in battlegrounds. You can trade items, put items up at the Auction House and bid on items there, and how much gold you want from (or for) them. You start out walking and running, but at higher levels, you can ride a mount, which makes your travels much shorter. In some places, given the right requirements, you can explore the world from the air and travel even more rapidly with a flying mount. You can fight solo or with a party. Within a fight, you have a wide selection of abilities and spells to choose from. You can play offensively or defensively, or choose not to directly fight at all. All these customization options give you a vast amount of things to choose from. Because of this, the game really never becomes boring. There is so much content that to explore every secret of the world, every combination of races, classes, and professions, and every style of play, would require infinite time. When you play this game, almost no matter what you do, you feel as if you are advancing in something. The basic form of progress is leveling, in which you become stronger by having your stats increased, and by which you unlock different gameplay mechanics. In the beginning, your options are relatively limited (though still huge). As you level, you gain new skills, spells, gold, and other abilities. Your ability to kill monsters, complete quests, and even travel around the world increases. Exploring the world really feels like progress. At first, the map is mostly blank, giving you only an outline of the world. As you travel around, landmarks and regions start appearing on your map. Completing quests for different factions increases your Reputation with that faction. As your reputation increases, you gain ranks and receive bonuses when dealing with that faction. At certain levels there are new things you can do. You can unlock the talent panel, the dungeon finder, mounts, as well as the continents of Outland and Northrend. And then there are Achievements. Doing certain things will earn you Achievements, which increase the number of Achievement points you own. This is addicting as it gives you an incentive to do something that would have otherwise no gameplay value. You are doing it just for the achievement. When you hit the max level, or are in any fixed situation, you will still want to improve. You do this by optimizing everything. If there’s an item you have that adds 50 armor, and there’s another that is otherwise identical but with 55 armor, you will feel very strongly compelled to obtain the more powerful one. You’ll hunger for the sword that gives 200 damage over the one you have that gives 185. Within a battle you’ll want to optimize the amount of damage you are doing, to try to finish the battle as quickly as possible. You’ll figure out the optimal order in which you use your abilities, the optimal equipment for doing so, the optimal setup, the optimal environment, etc. You’ll want to be the most efficient. Even in travel, you’ll want to get from point A to point B as quickly as possible. You’ll find the optimal route, and you’ll use the fastest mount you can. If you have 5 quests to complete in 5 different locations, you’ll figure out the optimal order in which to complete them as to minimize the traveling time. You can never be the best. You can always be better. Of the four reasons I list, this one is the most separate. Largely, WoW is a move away from modernity and towards the old, if not ancient, past. Besides the Dwarf and Gnome engineering projects, which are more funny than representative of technology, the game is almost completely at peace with nature. The Night Elves especially represent a love towards nature, and they guard it with utmost respect. It happens to match the environmentalist movement happening right now. There are quest lines aimed at stopping a deforestation (of Ashenvale Forest). In The Burning Crusade, the Fel Reaver is a colossal enemy war machine portrayed as highly destructive. In general, many enemies are associated with trying to destroy the environment, and this is an idea that definitely rings in our current society. 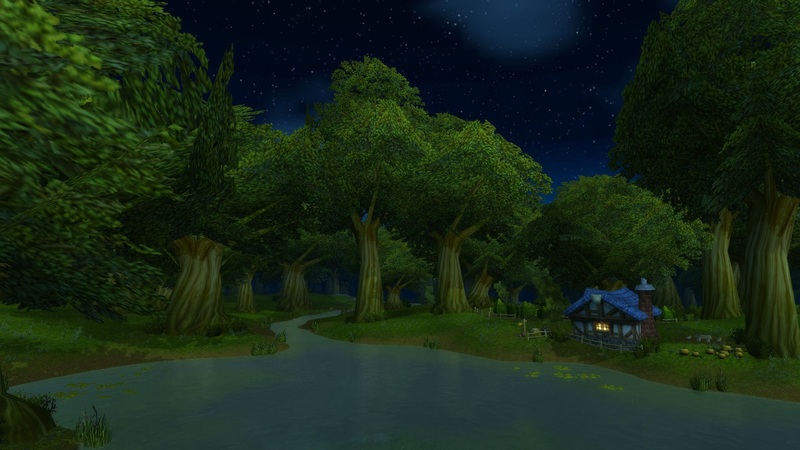 World of Warcraft’s scenery in some zones can be very beautiful, and they show a pristine nature that we cannot easily visit in our own world. Therefore, playing WoW is like visiting with nature. Just google wow screenshots and look at the ones that are outside. Some of those areas make you feel that the game world is so close to nature that it is more real than our own. Hence we don’t want to leave it. Just as WoW is a throwback to nature, it is also a throwback to mythology and the belief in magic. Azeroth is a world of imagination that can seem more convincing than our Earth, and far more mystical. If what we are looking at is a representation of a more primitive way of life, it is no wonder than World of Warcraft is so successful. Even the interface looks ancient: for reading, it is often scrolls and parchment. Even the professions, such as fishing, cooking, and herb gathering, are a nostalgia for an earlier time. 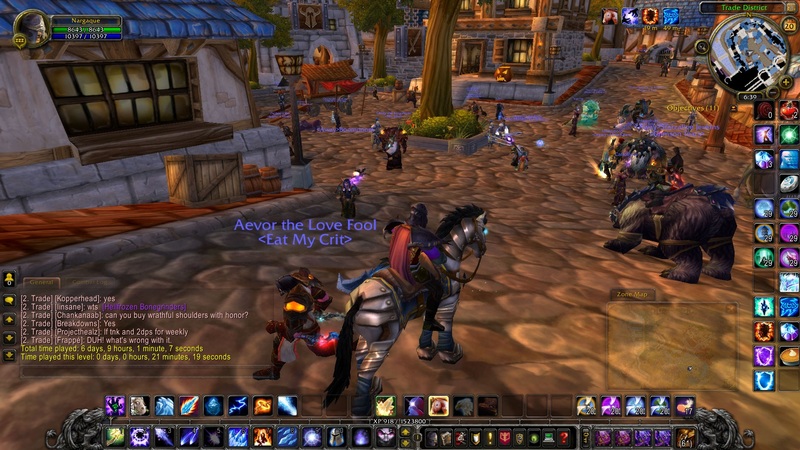 World of Warcraft is a great and successful game, but it is also terribly addicting. It will drain hours per day and affect schedules. It is addicting because it allows us to not only play a game, but also to experience and live in a new world. This world allows us to connect with nature, or at least, what we perceive to be nature. In the future, what will dominate virtual reality might not be a virtual reality of the real world, but instead, a virtual representation of an older, more forgotten world, with ties to our ancient past, its history and its traditions. I thought it was a fun 20 days, but I must tell myself to stop the experiment now, while I still can. 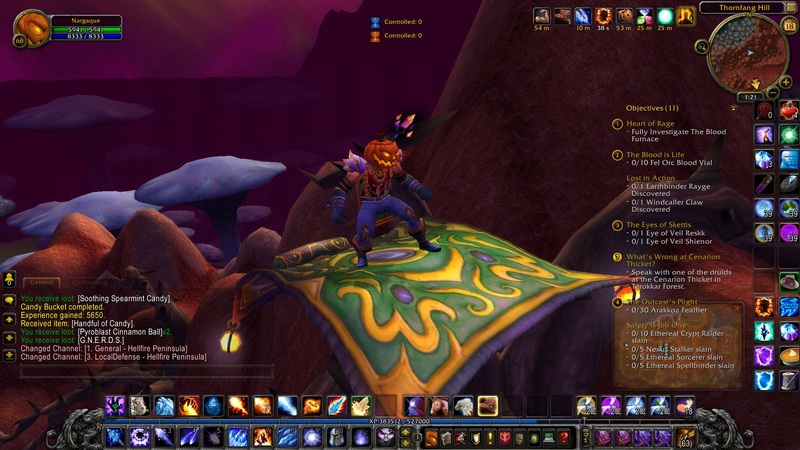 Finally, for a parting to WoW, I created this Halloween screenshot. Enjoy! This experiment, needless to say, has had some major effects on me. I will be trying to get back to normal schedule the next few days. So while I am not going to conduct another experiment like this for some time, I am opening this up to the public as to what my next experiment should be. I’d rather it not be playing another video game. Also, I will not consider anything with drugs or alcohol, etc. If the idea is feasible, and has some worth to it, I’ll consider it.